Question 18. What is the punishment for sin? Question 19. Who made hell? Answer. For bad children and godless people. Question 21. Who are bad children? Answer. Those who are disobedient to their parents and superiors and despise God’s commandments. Question 22. What punishment do those in hell suffer? Answer. They burn in the eternal fire. Question 23. Do you want to go there? Answer. No, I want to go to heaven. Question 24. Who will go there? Answer. All good children and believing people. Question 25. What do they do there? Question 26. Who shall bring us there? Question 33. How does he save us? Answer. Through his suffering and dying. Question 36. For whom did he die? Question 37. Who are his people? 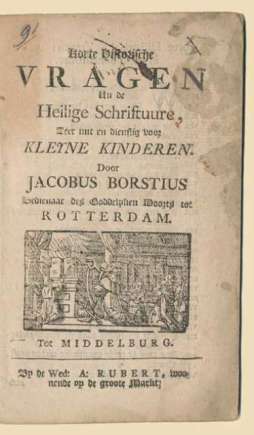 We see here that children raised with Borstius’ catechism would certainly be safeguarded against the tendency of covenantal automatism, that is, complacently considering yourself quasi-automatically saved by virtue of being a covenant child. To discuss the idea of hell and the wrath of God with little children may seem unpalatable to some in our day, but it is included for very good reasons. The warning about what happens to “bad children and godless people” is included in order to incite them to flee the wrath of God and find refuge in “our Saviour”. Thus, from a young age, children were made aware of their own predicament and the necessity of fleeing to Christ for salvation. Borstius makes it clear that Christ’s death is only efficacious for believers and that one does not need a great knowledge of theology to understand the doctrine of particular redemption, as is here simply presented to little children. He makes it clear that the questions “Did Christ die for me?” and “Do I belong to Christ?” are the same as “Do I believe in him?”. This simple and practical presentation of doctrine for children shows that the Reformed not only believed in theology for the laity, but also for the smallest children.